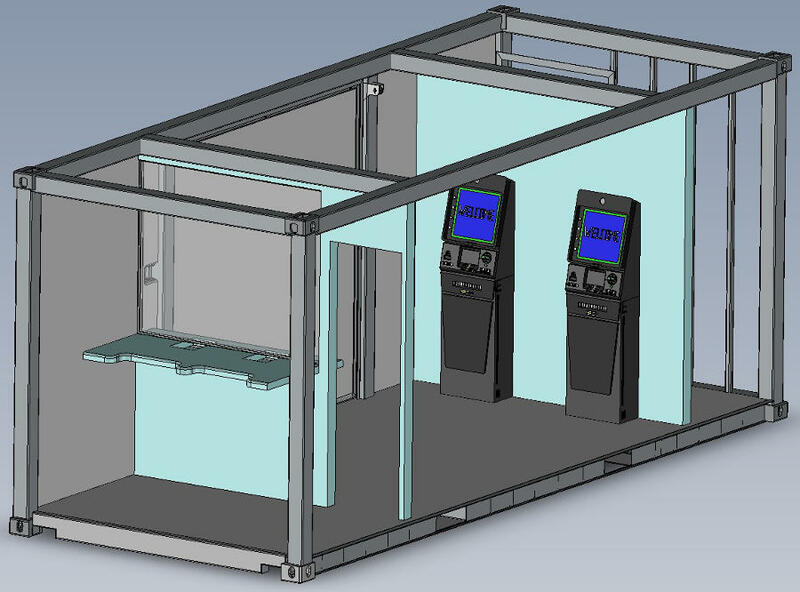 Today we are giving you a sneak peek into one of our concept containers, a Ballistics Proof ATM Container unit. These units are as tough as they get, protecting assets wherever you need to dispense an ATM. The units are covered in Armox armor; 300 HBW to ultra-hard 600 HBW high quality steel – up to 3 times harder than the stainless steel commonly seen around the home and harder still than the steel used in skyscrapers. The ballistic sheeting, able to handle a direct AK47 attack, covers the outer perimeter of the container and a foldout door (controlled on the inside by winch and pulley) provides the only internal access. The ATM itself is covered in composite material, rendering it resistant to explosions. To refill the ATM, there is a dedicated access door for service staff and dedicated access to teller stations. The entire unit was designed with security in mind and is highly resistant to theft or damage, essentially limiting the chance of theft before it even happens.